Warren P Ruth Painting & Paper Hanging Company is a Full Service Painting Contractor offering High Quality Painting Services for all your Residential, Commercial and Industrial projects in Berks County, Pennsylvania since 1928. We use only the highest quality paints and our professional crews are safety trained and oriented, with many years of experience in the painting industry. 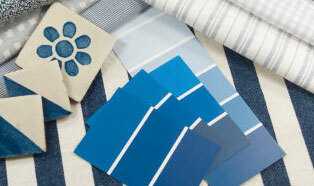 We provide on-site free estimates and color consultation tips if needed. Contact us today to talk about your next painting project! Whether you need interior painting to makeover and set the mood in your home, exterior painting to make your storefront look brand new again, Warren P Ruth Painting & Paper Hanging Company can not just meet but exceed your needs. Good quality paint application not only looks great, it helps protect your home or business from the elements as well as general wear and tear. Warren P Ruth Painting & Paper Hanging Company understands accidents and disasters happen. But know that we are there to help repair them and have your living or working space looking great again in no time. Whether you need drywall repairs due to force or to remediate water damage, Warren P Ruth Painting & Paper Hanging Company is here to meet all your residential and commercial painting, remodeling and restoration needs! Exterior Pressure Cleaning, Power Washing, Deck Staining Refinishing & More! We don’t just offer painting. Whether you need deck staining and refinishing for outdoor entertaining, power washing to clean the outside of your house or business; call on Warren P Ruth Painting & Paper Hanging Company and we’ll do it right the first time! A clean and attractive home increases curb appeal and envy from the neighbors while a clean storefront attracts new customers and keeps existing coming back!